Short on time? 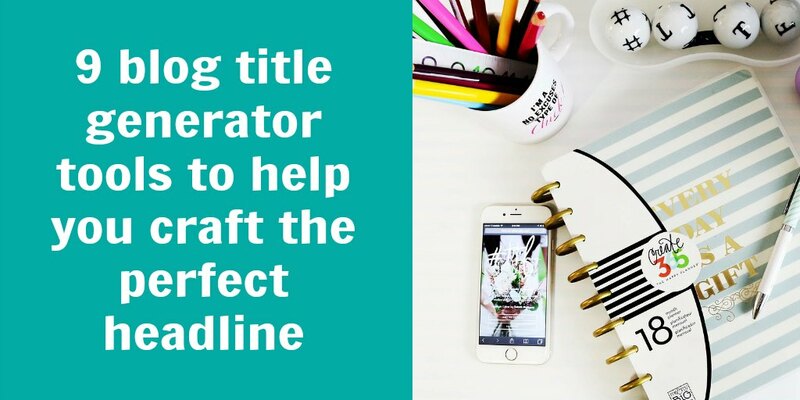 Download our 72 blog post title templates to create killer headlines. You’ve selected the perfect longtail keyword, crafted an engaging post based on it, and found some amazing eye candy to complement your copy. Now it’s time to write a title for your post. The problem? You’ve been staring at your screen for 30 minutes and can’t come up with anything better than “10 really good cupcake recipes”. (We hate to break it to, but you’re right-that’s not going to cut it.) But don’t start eating your feelings by inhaling a cupcake just yet. Why? 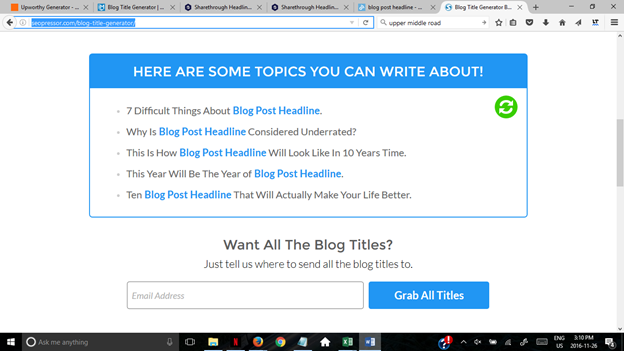 Because we’ve got a list of 9 blog title generator tools to help you craft the perfect headline. HubSpot created this tool to help people generate topics for blog posts, but you can use it as a blog title generator too. Just type your keyword into one of the “noun” fields and the tool will generate some titles for you. 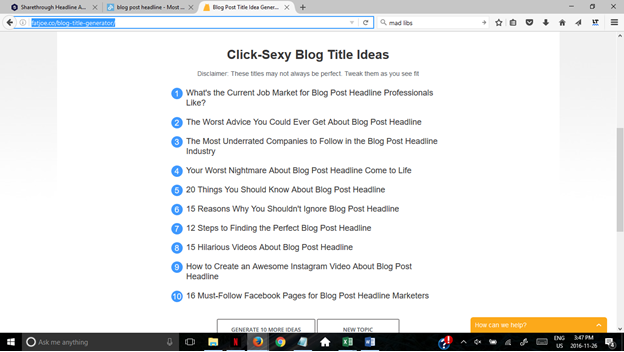 As you’ll see with many blog title generator tools, HubSpot’s tool takes tried-and-true title templates and inserts your keyword into them. That’s why some of the titles generated by these tools won’t make sense for your post. 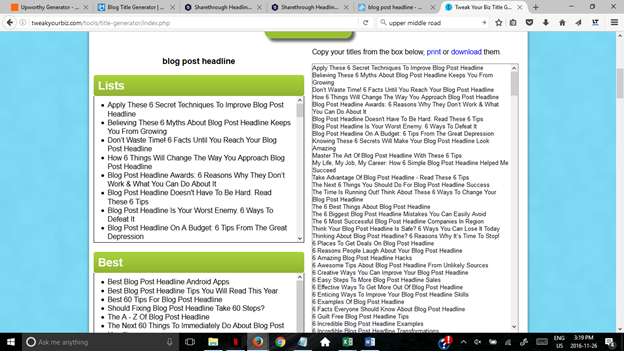 In this example, it wouldn’t be too hard to make Titles 2 or 5 work for a post about blog post headlines, but the others aren’t such a great fit. 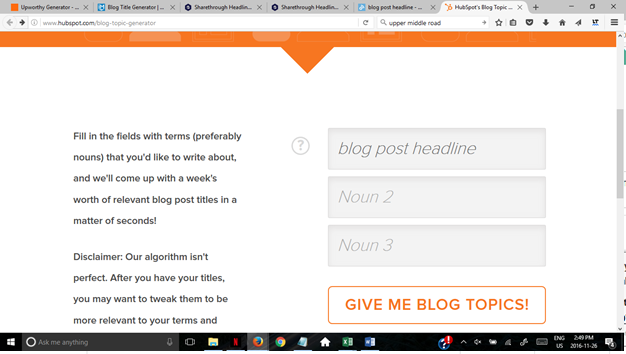 You’ll also notice that some generated titles won’t be grammatically correct (which HubSpot notes in its disclaimer). So be sure to tweak them as needed. 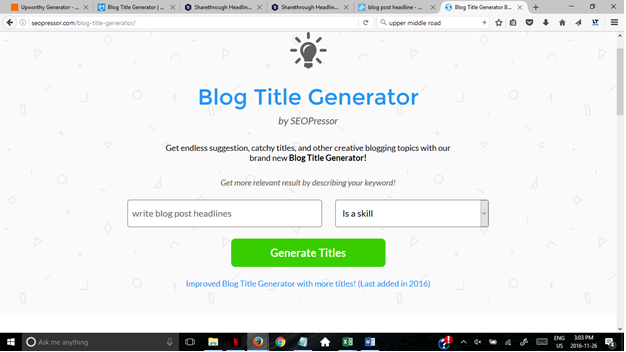 Similar to HubSpot’s tool, SEOPressor’s blog title generator lets you generate titles based on a keyword. 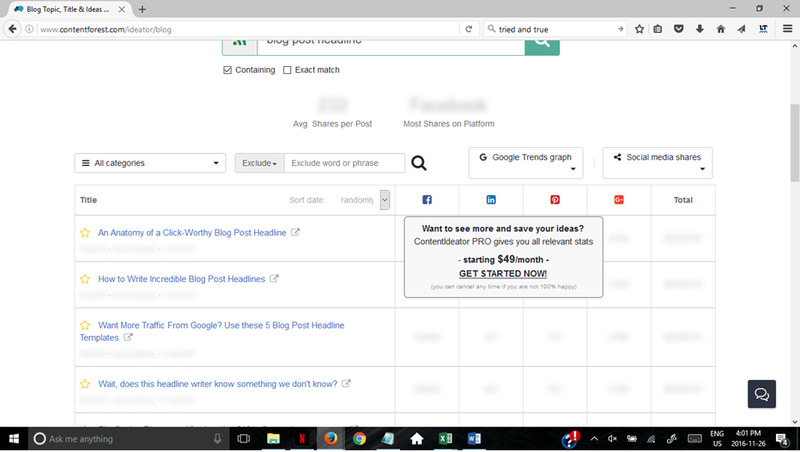 It also lets you indicate what category your keyword falls into so that the tool can generate blog post titles that fit the category. As you can see, the first title is probably the only one that would fit a post on blog post headlines. You can click on the green refresh button to generate a new set of titles for the same keyword, but you might still end up with a bunch of titles that don’t make much sense for your post. 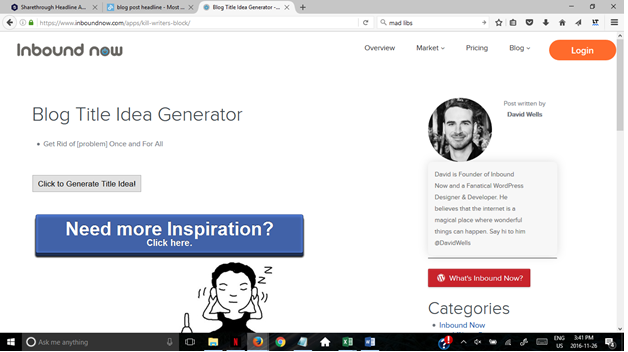 So although this blog post generator is helpful if your keyword fits one of the predefined categories, you might not always be able to use it as your go-to tool. Some of the categories that appeared in our sample search were lists (e.g., “Apply These 6 Secret Techniques To Improve Blog Post Headline”), business-based titles (e.g., “Fascinating Blog Post Headline Tactics That Can Help Your Business Grow”), and titles related to motivation (e.g., “Create A Blog Post Headline You Can Be Proud Of”). 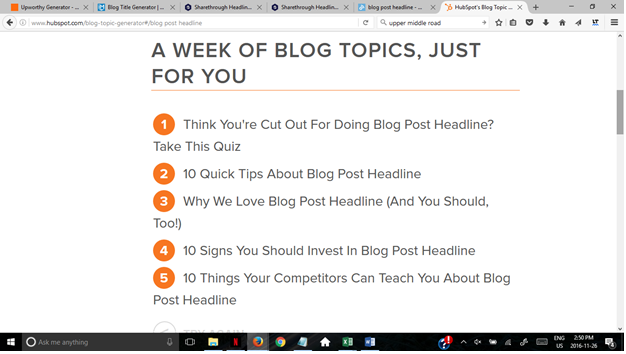 Of course, you’ll also get a ton of titles that won’t fit your post (e.g., “How To Be Happy At Blog Post Headline – Not!” and “6 Romantic Blog Post Headline Holidays”), so you’ll need to comb through the list. It would be easy to make some of these work. Title #5 is a good example of this. Others are downright off, though. Take a look at Title #1. This tools by BlogAbout works a bit differently from the others we’ve talked about so far. 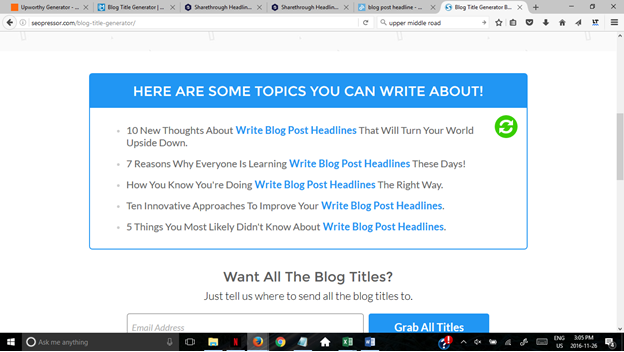 Instead of generating complete headlines (which, as you’ve seen, often aren’t grammatically correct), it generates fill-in-the-blank templates. Remember Mad Libs? It’s the same idea. Like you can with many of the other tools, you can press the refresh button beside the heart if you want the tool to generate a new template. You can also click on the heart to add a title you like to your list. This tool does require a bit more work than some of the others because you’ll need to fill in the template. But it can also encourage you to think more carefully about whether each set of words generated by the tool really are the best fit for your post. Some templates can work for a wide range of posts, but others are much more specific (e.g., “The Top [Number] Most influential [Industry] Twitter Accounts”). The templates also aren’t keyword- or industry-specific, so you might need to click through a few before you find one that fits your post. What’s great about this tool is that you get to see data on how many times a post with a particular title was shared on different social media platforms. Of course, the title of a post isn’t the only element of a post that determines whether it gets shared. But you can still look for trends in the structure of titles for posts that get good engagement. See one you like? Adapt it for your own post. 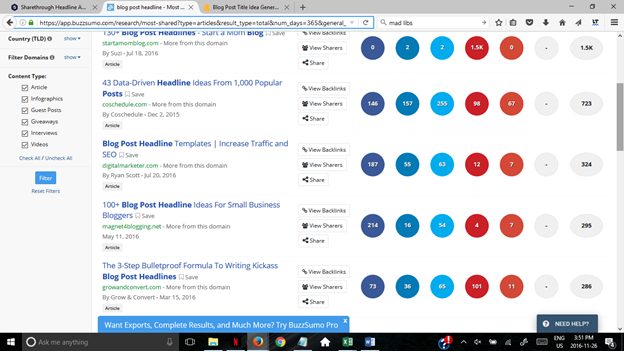 Like BuzzSumo, this blog title generator by ContentForest shows you actual titles from real posts. What’s the benefit of this? You’re more likely to get a list of titles that are polished and free of grammar errors. Crafting a solid blog post title isn’t easy. In fact, professional copywriters will often write a full page of working titles before they land on one they like. But this doesn’t mean that you need to dread writing titles for your posts. 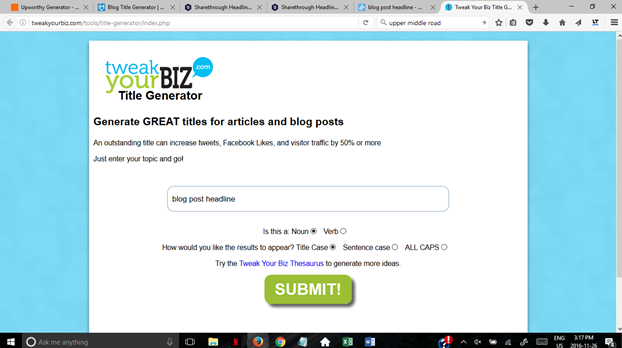 Blog title generator tools can help you structure your titles in ways that are known to work. And if you use these tools regularly, you can learn how to craft epic titles like the pros. Need some inspiration to help you craft the perfect headline? 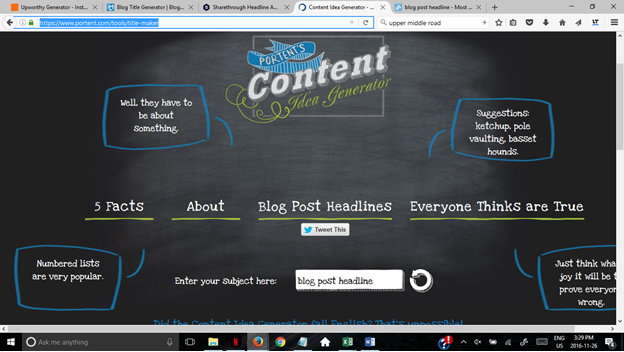 Download our 72 free blog post title templates below. ← “Before” vs. “prior to”: What’s the difference? I just finished a new copywriting tool. It works in a similar way to the tools mentioned in your article, however, during the development I played a little with an library which makes possible to conjugate verbs. As a result, when the user enters in the form the topic of his article or newsletter, e.g. 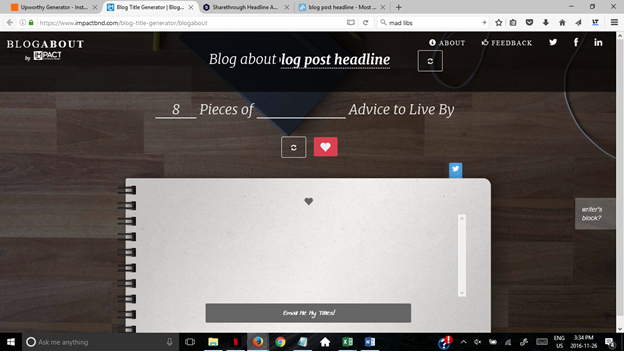 “start a blog”, the tool randomly generates titles not only like “7 ways to start a blog”, but also “How I started a blog and what lesson I have learned” or “Why starting a blog is not so difficult as used to be”. In addition, I have also created a Spanish version of the tool. Thanks for sharing your tool. Having a title generator that can conjugate verbs properly would be so helpful for many people. I’ll definitely check this out!